If you’re like many of our clients, you probably don’t have any experience with mediation, whether divorce-related or not. People are often more comfortable with the idea of a courtroom and adversarial lawyers because, for better or worse, they’ve seen that environment on TV countless times. Divorce mediation doesn’t make for very good television. As such, you might not know what to expect during your first session with our divorce attorney-mediators. The benefits of mediation are significant, but there’s always some fear when entering unexplored territory. This page will provide some important information on what you should expect during your mediation session. And, of course, we’re happy to answer any questions you might have. If you want to discuss a mediated divorce, please call Split Simple today at (855) 665-9920 or contact us online. The first thing to keep in mind about your divorce mediation session is that you will likely be in the room with your spouse. On rare occasions clients opt to retain attorneys during their time with us, and the role of attorneys in the process often means that the two spouses are in separate rooms throughout mediation. But you can expect to sit in a room with your spouse and our divorce attorney-mediator. As such, when preparing for divorce mediation it’s a good idea to ensure you’re mentally ready for such an arrangement. That can be a struggle for clients going through a particularly contentious separation. Your session will likely last around two hours. Clients generally require two sessions to reach a complete agreement. Our divorce attorney-mediator will keep track of financial arrangements on a spreadsheet that is projected on a large screen. We believe in a rigorous, transparent process, and this is a key part of it. It’s important to remember that our attorney-mediators are tasked with representing both parties and finding fair solutions. During your session, you, your spouse and your divorce attorney-mediator will discuss all the relevant issues, be they financial or familial in nature. These issues are often sensitive and complicated, but working through them is our goal. After your session, our attorney-mediator will e-mail you a comprehensive summary of what was discussed and decided upon during the session so there is no confusion or disagreement. These sessions are conducted in a calm, collected and patient atmosphere. We know the issues involved are emotionally draining, but we believe we can work through any conflict to find a reasonable solution. 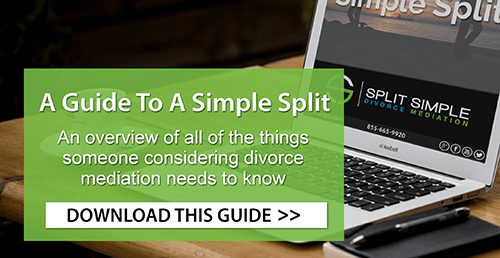 If you believe a mediated divorce might be the solution for you and your spouse, or for more information about Chicago divorce mediation please call a divorce mediator at Split Simple located in Denver and Chicago today at (855) 665-9920 or contact us online.